File 2017 Forms W-2, “Wage and Tax Statement,” with the Social Security Administration and provide copies to your employees. Provide copies of 2017 Forms 1099-MISC, “Miscellaneous Income,” to recipients of income from your business where required. File 2017 Forms 1099-MISC reporting nonemployee compensation payments in Box 7 with the IRS. File Form 940, “Employer’s Annual Federal Unemployment (FUTA) Tax Return,” for 2017. If your undeposited tax is $500 or less, you can either pay it with your return or deposit it. If it’s more than $500, you must deposit it. However, if you deposited the tax for the year in full and on time, you have until February 12 to file the return. File Form 941, “Employer’s Quarterly Federal Tax Return,” to report Medicare, Social Security and income taxes withheld in the fourth quarter of 2017. If your tax liability is less than $2,500, you can pay it in full with a timely filed return. 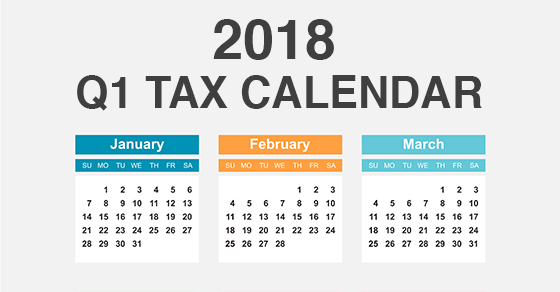 If you deposited the tax for the quarter in full and on time, you have until February 12 to file the return. (Employers that have an estimated annual employment tax liability of $1,000 or less may be eligible to file Form 944,“Employer’s Annual Federal Tax Return.”) File Form 945, “Annual Return of Withheld Federal Income Tax,” for 2017 to report income tax withheld on all nonpayroll items, including backup withholding and withholding on accounts such as pensions, annuities and IRAs. If your tax liability is less than $2,500, you can pay it in full with a timely filed return. If you deposited the tax for the year in full and on time, you have until February 12 to file the return.